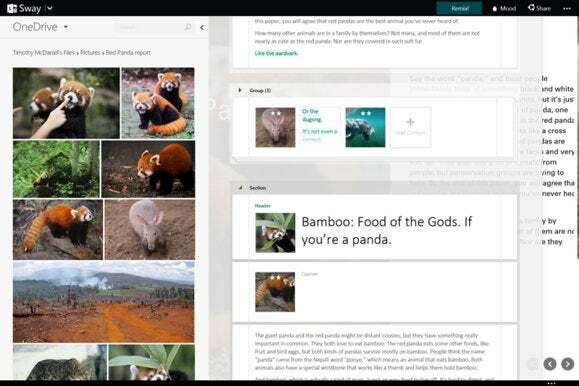 Microsoft Sway feels like Microsoft Word, reinvented by and for teens. It’s a fresh, fun, and free way to publish and share content, and my hope is that enough students and everyday users find and use Sway for it to become an established platform. Sway debuted at the beginning of October in preview mode, as the latest free Office app. Think of it as a simple, yet attractive, content creator for documents that can be shared online. As Web and magazine layouts collide, smoosh, and blur together, there’s a new emphasis on imagery and multimedia, both to anchor and supplement text. Sway recognizes this, and makes it easy to start building layouts that look professional. I was invited to try out Sway before it launches, and you can sign up for an invitation at Sway.com as well. At its roots, Sway feels like an extremely simple content publishing system, like Wordpress, but far more automated. The content management system PCWorld uses, for example, allows us to specify the size of an image and place it on the page. Sway eliminates all that, simply asking you to assign an image a “showcase” weight of between one to three stars. Then Sway will resize and position it accordingly, even allowing you to set it as a background image that text can float on top of. Still, the first few moments with Sway can be a bit daunting. Selecting a layout (for now, you can choose to wrap your text either vertically or horizontally) is easy, once you figure out that Microsoft has dubbed it a Mood. Moods include both the layout structure as well as the font style and color. Once finished, you can also use the Remix! (yes, with an exclamation point) to reformat your Sway in what I assume to be a random style. Once that’s in place, you’re asked to assign your Sway a title header and background image, which serves as a backdrop. Once that’s done, you can begin adding elements to your page. At this point, however, chances are that your Sway still looks a lot like a Word document. To see it in its full glory, you have to select the image to the right which sits behind the text document, known as a “Storyline.” It’s not that intuitive. Once in that mode, however, you can begin to see Sway’s full potential, and even edit. Or, if you wish, you can click the Storyline tab to the left and return to a text-based mode. In Storyline mode, there are essentially four elements: headers, body text, media (images, at this point), and files you can upload. Word files can be uploaded to OneDrive, and then they’re converted into text and inserted into the document. PDFs simply don’t work. Images, or media, can either be inserted individually, or stacked or placed in a grid. If they’re stacked, navigating through the Sway and clicking on the image stack allows you to view them as a 3D pile of images. This definitely isn’t Microsoft Word. 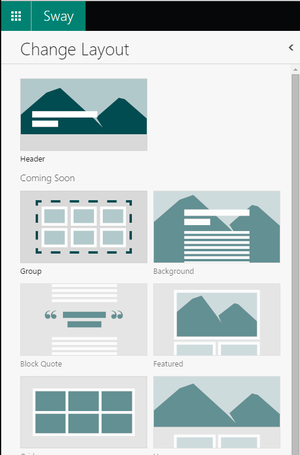 Only a few layouts are currently available in Microsoft Sway. I had forgotten that images can be loaded from OneDrive; in fact, if you add an image, a OneDrive pane pushes in from the left, with your stored image files already pre-populated. Maybe I’m easily impressed, but I found this delightful—I expected to have to wade through a Documents window. Where I’d like to see a bit more robustness, however, is in text editing. Right now, there’s no real way to change the font or italicize content. You can highlight text and “emphasize” or boldface it, but you can’t do anything else to it, even with a Word keyboard shortcut like CTRL-I (for italicizing). There's no spell-checking, in case you use that. And while Sway includes and resizes photos, I’d like to see the text do a better job of wrapping around images. Also, in keeping with Microsoft’s new Web-centric, always-connected mantra, you can’t print a Sway, only share them. That may limit its effectiveness in some circles. Otherwise, it’s clear that this is a work in progress. With Sway, Microsoft is signalling that its developers are boldly choosing simplicity as a counterpoint to Office’s hierarchy of menus and options. That’s a commendable decision. Still, I think there’s room to add more depth without complexity, and I’m intrigued to see what Microsoft can offer here. Even at this early stage, I’d recommend Sway. Sign up and try it for yourself.